Do you support the New Order of Highsec? Do you agree with the principles set forth in the New Halaima Code of Conduct, share James 315's vision of a brighter future, and wish to see him succeed in his mission of reform? 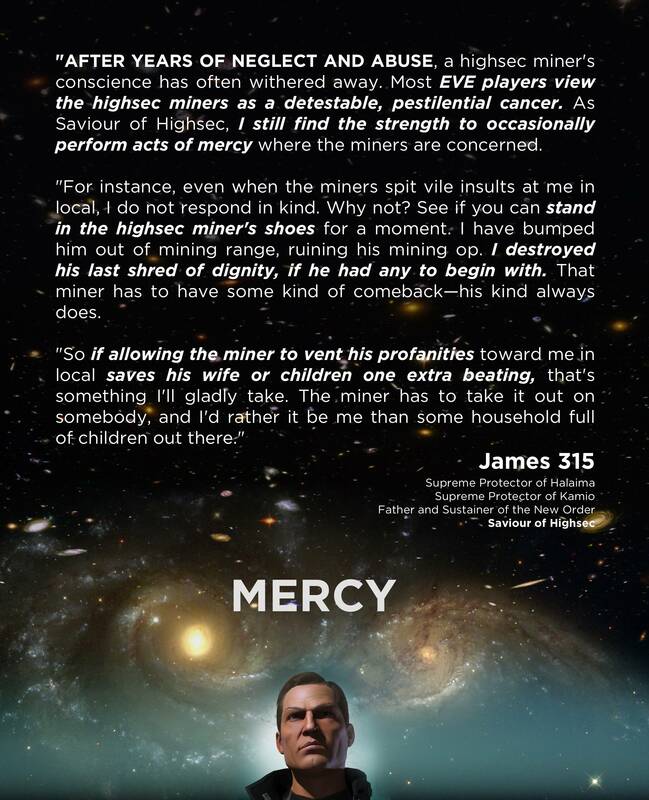 Do you believe the miners and other carebears of highsec need to be saved from their self-imposed boredom, misery, irrelevance, and oblivion? The New Order transcends corporations, alliances, and coalitions. There's no list of references or skill requirement needed for a new Agent to join us. Everyone in EVE who takes any action to support our cause is an Agent of the New Order. Whether it's something big or small, once or many times, within or outside of official EVE channels, whether it's taken by someone I know well or by someone I'll never meet--each action intended to influence others for the advancement of the New Order is the action of an Agent. This page contains information about how you can get started in your new career as an Agent. You can also keep up with your fellow Agents and receive assistance by joining the New Order's official in-game channel. Already, there are Agents everywhere: Players who joined the game less than a week ago, anxiously training up bumping skills. Players who have been around since the Beta who are looking for something new. Players who trade in Jita 4-4 and never undock. Players who pirate, scam, grief, can-flip and wardec for a living. Industrialists and mission-runners who want to liven up their home systems. Players living deep in nullsec who can't remember the last time they've been to highsec. Even players who live on the forums and can't remember the last time they've logged in! Yes, there are many Agents of the New Order out there. Their numbers are growing daily. Would you like to join them? There are many ways to support the New Order. Below is a list of just some of them. EVE is a sandbox, after all--perhaps you'll invent a new method of your very own. - Bump miners. All those who mine within the territory of the New Order (i.e., highsec) are deemed to have agreed to obey the New Halaima Code of Conduct. If miners refuse to pay you isk, bump them out of mining range. Looking for a good bumping ship? Please see this post for valuable information on how to bump and successfully extract mining fees from the miners. - Suicide ganking. Our valiant Knights have selflessly renounced the convenience of good standing with CONCORD and sworn an oath to remove illegal mining equipment (and other carebear decadence) from highsec. You can use a preexisting character to gank, or roll an alt to gank from an NPC corp or your own private corp. Or consider submitting an application to the New Order Logistics corporation, which belongs to the notorious CODE. alliance. See the Gank page for more info on training for suicide ganking. - Become a shareholder. By contributing isk to the cause, you don't merely purchase a voting interest and get in on the ground floor of a growing enterprise--our Shareholders take a stand. Being listed as supporters of the New Order, they strike fear into the hearts of disobedient miners and Code violators everywhere. The money you contribute for shares is used to reimburse our suicide gankers and keep the machine of war humming along. - Selectively attack. Suppose you are the sort of player who enjoys highsec PvP, whether it be suicide ganking, scamming, can-flipping, corp infiltration, wardeccing, etc. Odds are, you have a variety of targets you could attack at any given moment. Let your victims know that they have been attacked in the name of the New Order and provide them a link to this website. Remember, when you inflict damage on a player in highsec, it becomes a revolutionary act if it's done in the name of the New Order. - Espionage. Agents of the New Order provide me with eyes and ears everywhere. If you have intel on our enemies or catch them attempting to plot against me in secret, pass along the info. Corp infiltration or "awoxing" of carebears in the name of the New Order is always appreciated as well. - Voice your support. If you find yourself in New Order territory, you have the opportunity to add your voice to the chorus of support for the Supreme Protector of the system. Local belongs to you. Praise the Code often. Let the carebears never forget its importance. - Make some art. If you are artistically inclined, or if you simply have a paint program and a bit of free time, you can express your enthusiasm in the form of artwork such as this poster made by Shareholder Sun Win. All artwork submitted to me is available to view in the Links section. - Spread the word. If you support our vision, there's a good chance you know other people who are favorably inclined toward the cause as well. Let them know about the New Order and about this website. Mention it in chat or on forums, link it in your bio, link it in your EVE-O forum signature. You might even be able to recruit new players to EVE. The more the merrier!